What's a fireplace without a beautiful mantel? Fireplace mantels (or mantelpieces) date back to medieval times when their sole purpose was to catch the smoke of the burning fire. Nowadays, mantels are used as an interior design element that can enhance the look and feel of your home. Here are some unique fireplace mantels worth replicating. Photos Of 6 Custom Fireplace Surrounds And Mantels That Provide A Unique Sense Of Character… In One House! 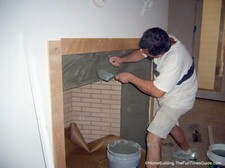 There are so many options when it comes to the type of material and style of fireplace surrounds that are available. You can stick with a standard kit or go for broke with a custom made fireplace surround that makes a statement in your home. The stacked stone sunburst surround design of this fireplace is a marvelous piece of stonework. The keeping room, with it’s cathedral ceiling and open web wooden beam ceiling makes for a wonderful place to gather with friends and family around the fireplace. Here are some photos of an Isokern fireplace/chimney systems, mortise and tenon joinery, a reclaimed antique terra cotta roof installation, an exposed oak beam ceiling and an authentic stone wall being built. Great ideas!